With rising inflows of immigrants in rural and small towns (RST) of Canada, all levels of government are playing greater role in their settlement and economic integration. As one of its mandates, the ARGEIAD promotes research and knowledge mobilization focusing on regional dimensions of immigration, aging and diversity in order to uncover the facts about their economic significance. On September 15, 2015, the group organized a public outreach event on immigrant settlement service delivery in Canada to promote discussion on rural/urban challenges and public policy response. The event was held in collaboration with the Province of Nova Scotia, the YMCAs of Nova Scotia and Immigrant Services Association of Nova Scotia (ISANS). Audience included the three levels of government, businesses, community organizations, faculty and students. The keynote speaker, Dr. William Ashton, Director, Rural Development Institute, Brandon University, Manitoba, was invited to present the results from his study: Settlement Services in Western Canada: Results from 29 rural and small centres which spoke to direct implications for Atlantic Canada. Dr. Ather Akbari welcomed the audience and the Honourable Lena Metlege Diab, Minister of Immigration, Province of Nova Scotia, gave her opening remarks. The Minister highlighted the importance of immigration in the Province of Nova Scotia, in the light of its demographic and economic implications, and the attention her government pays to their successful integration in society. The need for their settlement in smaller areas of the province is also a priority for the present government. As the following chart shows, RSTs in Western and Atlantic Canada have experienced significant increases in the arrival of new immigrants since the beginning of the current millennium. Dr. Ashton’s study identified some challenges in integration and provision of settlement services in rural Western Canada that are shared by Atlantic Canada. Presentations by Nabiha Atallah of ISANS and Barbara Miller Nix of YMCA discussed those challenges faced in the Province of Nova Scotia. The YMCA is the primary settlement service provider in smaller centres across Nova Scotia and hosts onsite YMCA staff in Truro, Amherst, Pictou, Sydney, Bridgewater, Yarmouth and Digby, serving these communities and the surrounding areas. ISANS is a specialized immigrant services organization that has been serving newcomers to Nova Scotia since the early 1980s. Both YMCA and ISANS receive their major immigrant settlement funding from the Government of Nova Scotia. 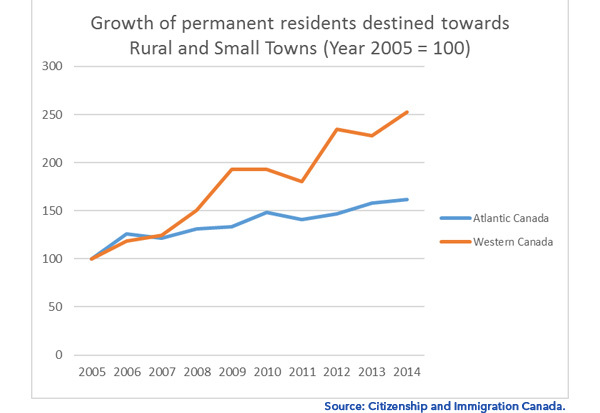 Immigrant settlement remains a challenge across much of Western and Atlantic Canada. The needs of newcomers are similar in the two region. Employment and a lack of key services, such as health care, are major challenges for economic and social integration of newcomers. Language, recognition of foreign credentials, skill development, transportation and lack of childcare services are important barriers to finding employment which need to be addressed. Settlement services are limited and due to lack of funds, service providers are unable to expand their coverage to remote communities. On the other hand, language barrier also limits the accessibility of services for the new comers. As rural communities are spread over a large and thinly populated area, a partnership model among service providers will be a key to success in service delivery in both regions. This is an area where the Government of Canada’s model of Local Immigration Partnership (LIPs) can also be applied. Through LIPS the Government of Canada supports the development of community-based partnerships and planning around the needs of newcomers. LIPs seek to engage various stakeholders in a locally-driven strategic planning process including employers, school boards, health centres and networks, boards of trade, levels of government, professional associations, ethno-cultural organizations, faith-based organizations, and the community and social services sectors. Dr. Ashton’s study is based on a comprehensive survey of rural communities in Western Canada with interesting policy implications for improving settlement services in rural Canada. However, each region has its own challenges. In Atlantic Canada, there are about 40 immigrant settlement service providers, including settlement agencies, YMCAs and community organizations, who receive funding from the federal and provincial governments (as mentioned in Nabiha Atallah’s presentation). A similar survey of these service providers will uncover any unique challenges faced by them. Finally, the public good nature of immigrant service delivery provides an economic rationale for government subsidy of these services. The Government of Nova Scotia provides funding to both ISANS and YMCA in provision of services to immigrants settling in urban and rural areas, respectively. ISANS is a large scale service organization specializing in immigrant services while the YMCA has experience in providing services to a broad spectrum of society including youth, seniors, adults with disabilities, and immigrants. Hence, to enhance the returns to government funding requires obtaining a balance between the benefits of the economies of large scale provision of specialized services and an in-person local services to newcomers settling in rural communities that are widespread in the province. The survey of settlement providers suggested above can also reveal if that balance is being achieved.